The Coincident Points Tool takes a raw survey x,y,z file as input and searches it for occurrences when the same x,y location is surveyed multiple times. The tool outputs a shapefile that contains the x,y locations, the two different z measurements and the difference between the z values. The difference between the z values can be used as an estimation for uncertainty at theses x, y locations At these locations raster values, such as slope and surface roughness, can be extracted and used to model the relationship between these external parameters and point uncertainty. For conceptual background about how these coincident points can be used to model uncertainty click here or for a tutorial on how to get started on uncertainty analysis with the output from this tool click here. 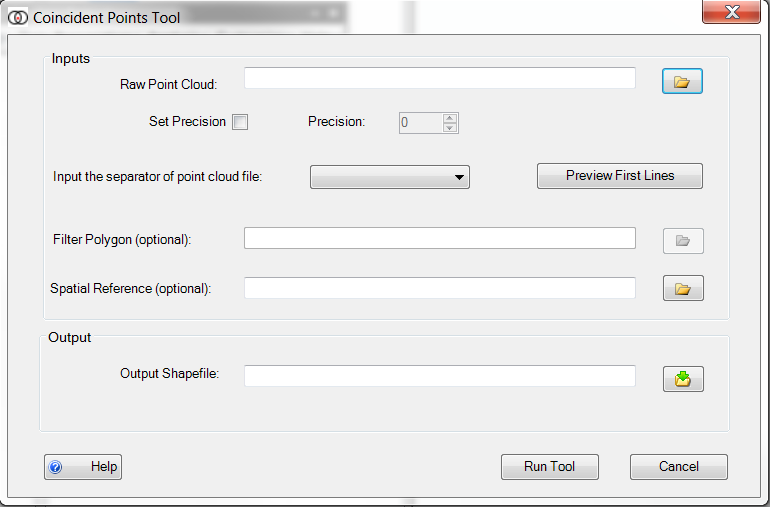 By setting this check box the user can select a matching point precision to use other than an exact match of points. If a precision other than 0 is set then a point does not have to be an exact match to be considered a coincident point. This is mainly used when using highly precise points, i.e. a 2 (x,y) points of (1.0001, 1.0000) and (1.0002, 1.0001) would be considered a match if the precision was set to 3.
contains fields of x, y, 2 different z fields, and a field that contains the difference between the 2 z values.